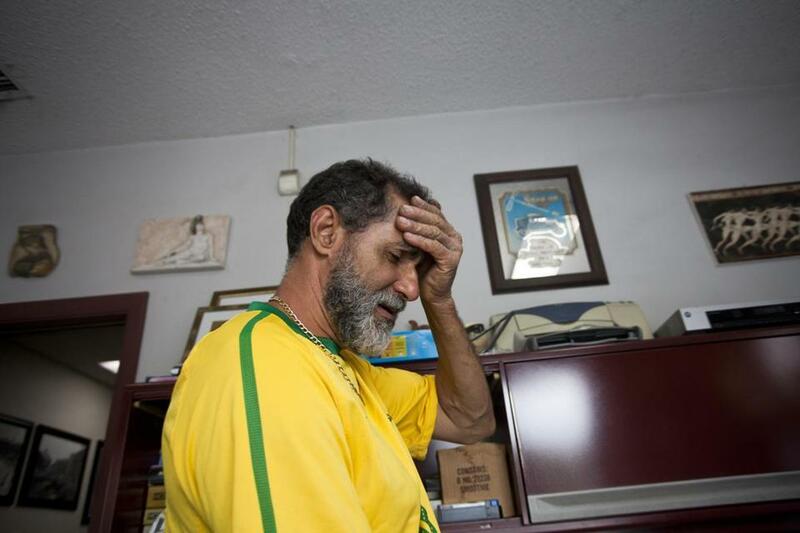 Brazil’s loss to Germany took its toll on Santo, a worker at J & K Auto Body in Brighton who put on the colors of his home country. I gave it one more try. Mocked, ridiculed, and threatened by soccer krishnas around the globe, I pledged to give the Beautiful Game one more chance on the occasion of the World Cup semifinal featuring host country Brazil and Germany. And it was ugly. Who knew this would end up being the equivalent of the 1940 NFL championship game that resulted in a 73-0 victory for the Chicago Bears over the Washington Redskins? Germany beat Brazil, 7-1, Tuesday. The Germans will play the winner of Wednesday’s Netherlands-Argentina match in Sunday’s World Cup final. It does not matter. I am sorry for the disgrace of Brazil, but I now love Futbol. I love it because I have seen it through the eyes of the owners, workers, friends, and customers of J & K Auto Body, just a few feet from Oak Square in Brighton. J & K is owned by John Sarianides, a Greek immigrant who loves soccer and has accommodated his staff and friends since settling on this spot in the late 1980s. John’s eight-man shop includes his two sons and a team of fender-pounders and chassis painters who are allowed/required to take the day off for World Cup games. John is my friend. He came to America from Greece in 1968, when he was 17. He has built a fine life the American Way. He loves soccer and the World Cup and made a pilgrimage to Brazil last month, traveling around the globe to watch four World Cup games during a magical two-week stay in South America. There is no group with more conviction and less sense of humor than soccer fans. Fortunately, Red Sox fans seem to have a better grip. Here is everything you need to know about John Sarianides: When he won a quarter of a million dollars after purchasing a lottery ticket from a 7-Eleven store adjacent to his shop, he returned to the store and put $10,000 in cash on the counter for the young man from Ghana who sold him the ticket. John’s next move was to give all of his shop workers $1,000 in cash. Share the gold. After explaining the perils of associating with me during World Cup season, I asked John if I could watch Tuesday’s game in the office of his shop in Brighton. He said yes, of course. So there I sat, under the cheesy Greek art, adjacent to the desk of the man who spends his days fixing cars and bringing us all together. The game was terrible, but that didn’t matter. What mattered was the notion that we were all there for the same thing: We were celebrating a world event. In three hours, I heard toasts in Portuguese, Greek, Italian, Irish, Hebrew, and German. It was dazzling. It was the ultimate democracy. At one point, I asked John about the languages spoken in the garage at his shop. “We have Portuguese, Spanish, Greek, and Italian,’’ John said. No joke. Watching the World Cup semifinal, we had Santo, a shop worker from Brazil (“My wife and daughter both called, they were crying”); we had Tony — John’s cousin from Greece who grew up in Roslindale; we had another Tony, who was born in Italy and grew up in Argentina; we had Christian and Noly from Guatemala; we had Albert, a plumber from Israel; we had George from County Cork in Ireland; and we had auto body customers from Spain, Italy, Ireland, and the USA. 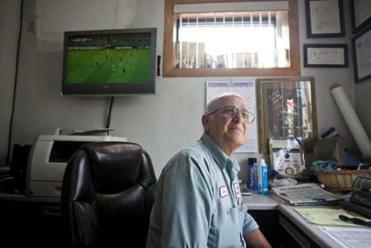 Inside J & K Auto Body in Brighton, any World Cup game is more than enough reason to take a break from work, thanks to soccer-loving owner John Sarianides. John had pledged to make me love the Beautiful Game. He had firm opinions about Brazil’s disgrace and coach Luiz Felipe Scolari. 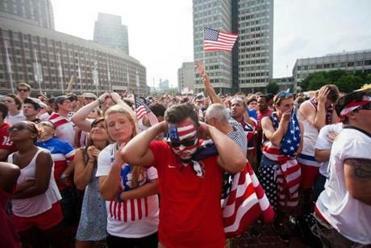 J & K Auto Body owner John Sarianides pledged to make Dan Shaughnessy love the Beautiful Game. “The Greeks, they like soccer, but they will get over it. The Brazilian people live for it. To exit like this, they really thought they had the World Cup. I don’t think the people there can face anybody. You don’t know how proud those people are. To see them on television with their faces down is hard. Tuesday was not a good day for soccer. Not a good day for the World Cup. But, finally, I am into the event. Argentina-Netherlands play Wednesday at 4 p.m. The World Cup final is Sunday at 3 p.m. These will be tough days in Brazil, but I believe that soccer will win.